Still at a loss about a placeholder ring? 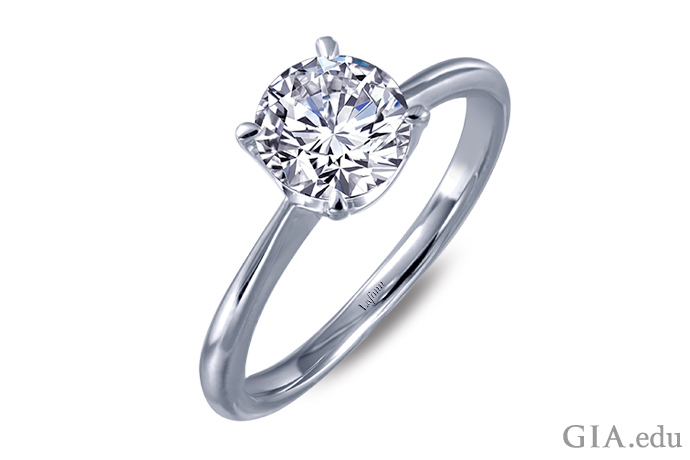 A diamond engagement ring is one of the most meaningful purchases you’ll make. It symbolizes the joining of two lives, abiding commitment and undying love. 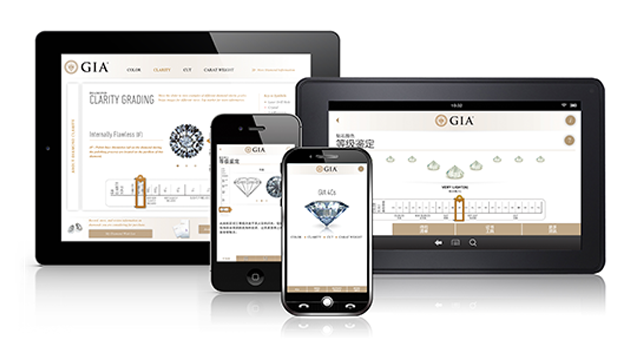 Picking the perfect engagement ring requires time and research, like learning the 4Cs of diamond quality: Color, Clarity, Cut and Carat weight. Sometimes, though, timing the proposal with the ring just can’t be done. That’s where a placeholder ring comes in. 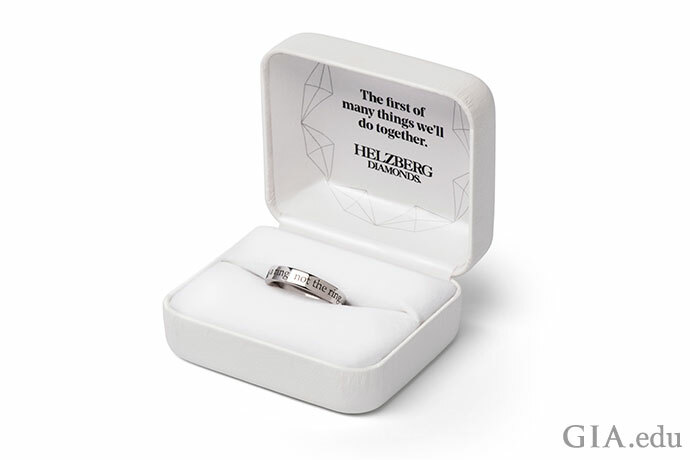 This temporary stand-in for a forever engagement ring lets you override the practical considerations of shopping for and choosing an engagement ring, so you can let your passion rule the day. There are lots of reasons for a placeholder ring. 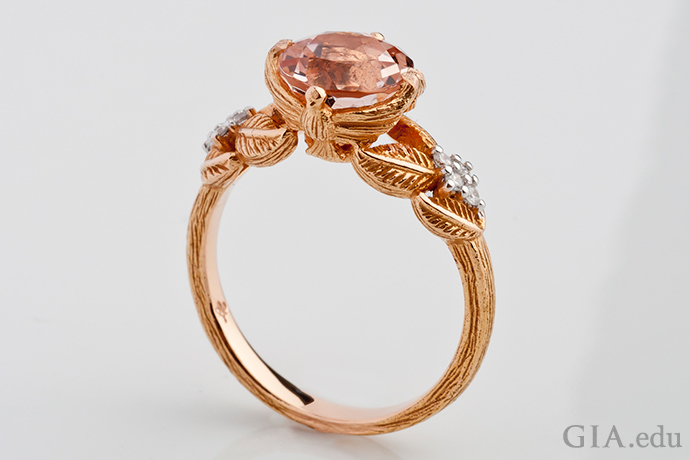 It’s a great option if you’re waiting for a custom engagement ring to be made. Or if you want to postpone the ring until after the proposal, so you can include your fiancée in the decision. 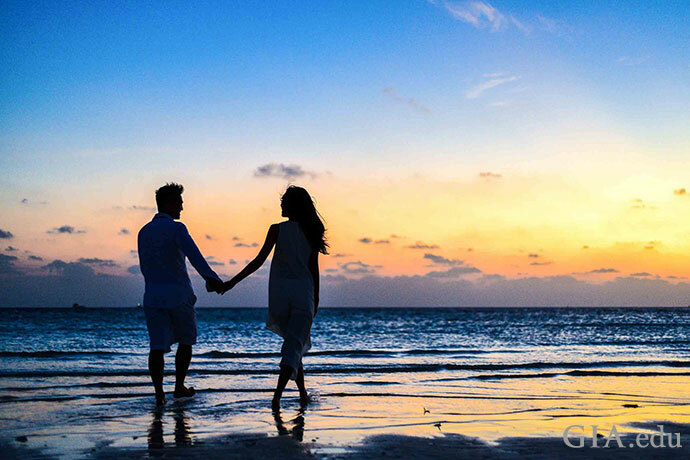 Considering a destination proposal? A placeholder ring lets you avoid the risks of traveling with an expensive engagement ring. And last, but by no means least, a placeholder ring means you can both commit to each other and to your joint financial priorities. A placeholder ring should be affordable – but that doesn’t mean it can’t be beautiful and thoughtful, and given with great love. You’ve got a lot of choices when it comes to rings, so let’s break them down. When it comes to placeholder rings there are no rules. 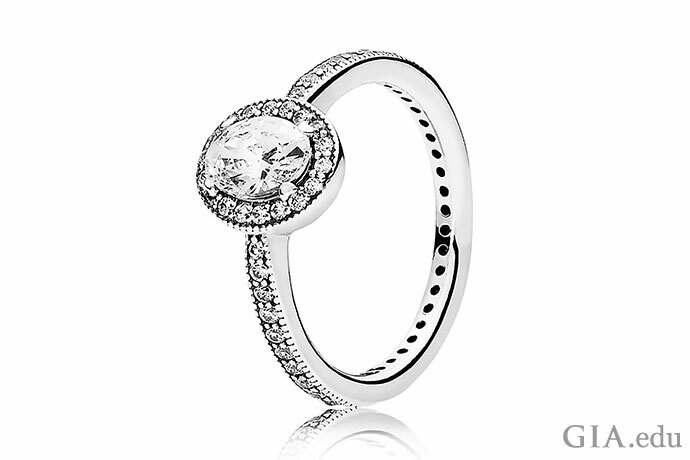 Any ring given with the right intentions can be a placeholder ring. Platinum is an expensive metal. So, you might consider saving platinum for your forever engagement ring. Gold, on the other hand, is durable, comes in a wide range of colors, and offers a broad range of price points, depending on its purity or fineness. The term karat (K) is used to state the fineness of gold, and indicates the proportion of pure gold alloyed with other metals. Lower karat gold usually equates to lower cost. For example, 14K gold is 14 parts gold and 10 parts alloying metal or metals, whereas 18K gold is 18 parts gold and 6 parts other metals. 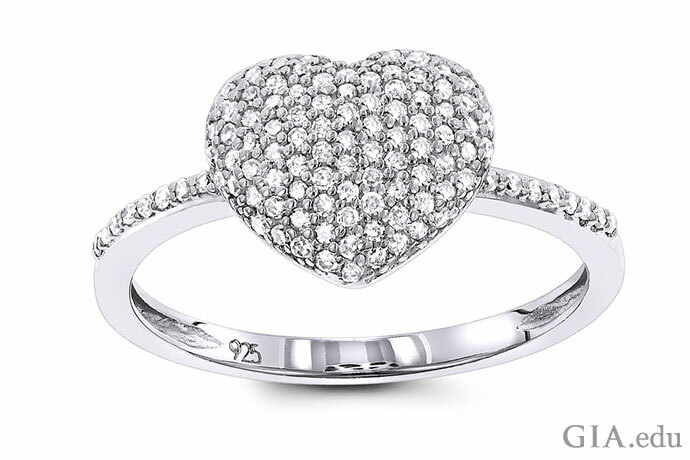 While you’ll have a tough time finding a platinum ring set with simulated gems (see below), you shouldn’t have trouble finding diamond or other gem simulants set in yellow gold, white gold or rose gold. 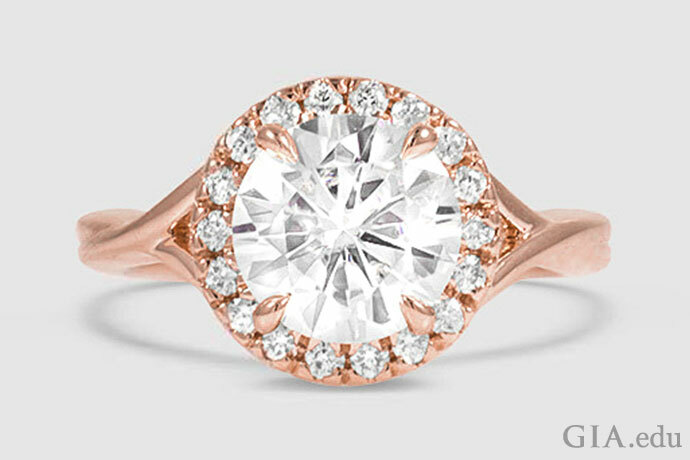 Learn more about yellow, white and rose gold. Sterling silver is a good choice for a placeholder ring. It’s less expensive than gold and platinum. But it has some drawbacks. Sterling silver is softer, so it scratches more easily. It also oxidizes, and when this happens, the metal’s surface darkens. However, oxidation can easily be removed by cleaning or polishing the metal. Take these characteristics into account and consider how long the placeholder ring needs to serve as a stand-in. If you want an edgier look for a placeholder ring, you could consider steel, titanium, tungsten carbide and other alternative metals. You’ll need to do a bit of searching for a placeholder ring made of these metals, as it’s difficult to set gems into titanium, stainless steel and so forth. Other materials, like wood, can scratch over time. So sterling silver and the different colors of gold are probably the best options for a placeholder ring. Diamonds have a place in placeholder rings. They add sparkle, symbolism and a sense of permanence, and they can be affordable. All things being equal, smaller diamonds cost less than larger diamonds. You can use this to your advantage to get a placeholder ring with diamonds. Here are a few options. Melee diamonds are small diamonds weighing less than 1/5 carat (ct). Melee diamonds can be as small as 0.001 ct (1/1000 of a carat). They are often cut into tiny round diamonds and set around a center stone or on the band. Melee diamond rings are significantly less expensive than rings with larger diamonds, and they make for a beautiful placeholder ring. Melee is also used to create cluster rings. 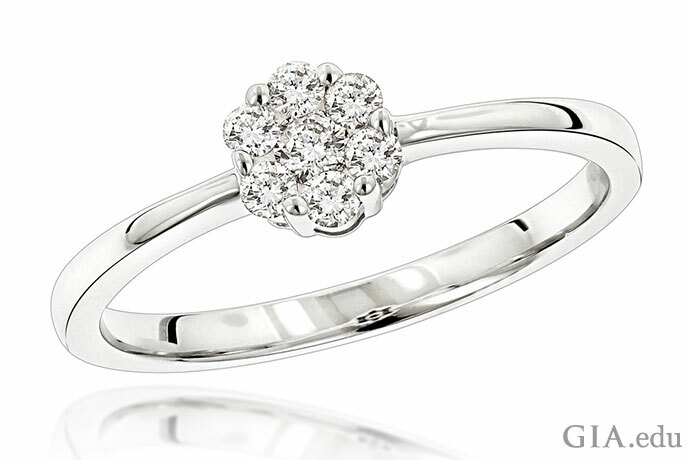 In this ring style, several small diamonds of similar size are set together in a group. This technique maximizes sparkle and gives the illusion of a single large diamond. 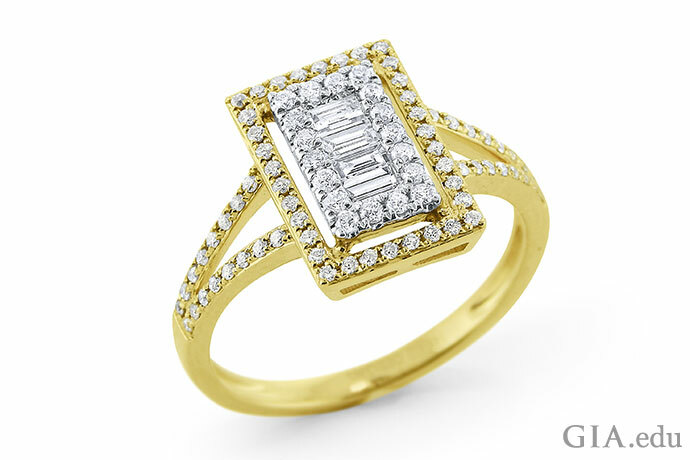 Baguettes are another type of diamond shape that can add glamour to a placeholder ring. Baguettes are small, usually rectangular, step-cut diamonds with straight or tapered edges. Some baguettes are almost square, while others have a length-to-width ratio of 5:1 or even longer. A tapered baguette diamond has long sides that angle inward. Another option for a placeholder ring is to purchase an engagement ring with a diamond simulant like cubic zirconia or moissanite. Diamond simulants can look like real diamonds, but they do not have the same chemical, physical and optical properties. They also don’t have the same fire, brightness and scintillation as a real diamond, so they won’t have the same dazzling sparkle. But diamond simulants look enough like diamonds to work in a placeholder ring. 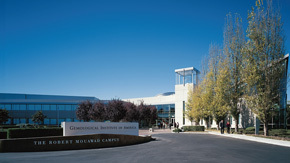 There are a number of different materials used as diamond simulants. Each one has its pros and cons. For example, colorless sapphire is a hard and tough gem, so it’s durable and can be worn as a center stone in a ring. But it’s not as bright or fiery as a diamond. Our blog on simulated diamonds reviews all your options. Just an aside: Don’t confuse simulated diamonds with synthetic diamonds. Synthetic diamonds have essentially the same chemical composition, crystal structure and physical properties as natural diamonds. And as a result, synthetic diamonds not only look like natural diamonds, they are also just as durable. 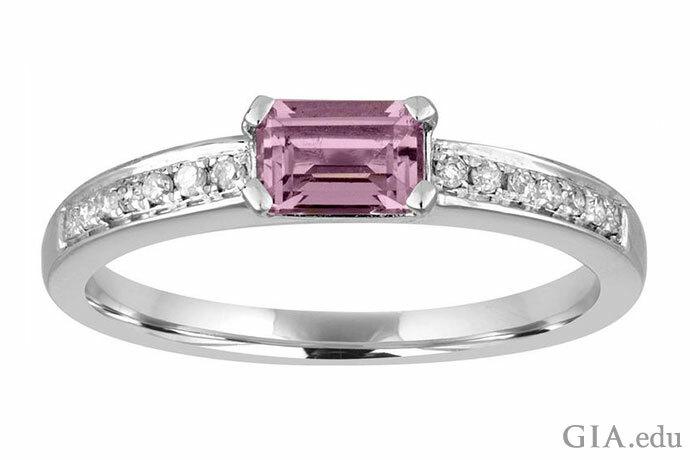 Some colored gemstones can be affordable alternatives for a placeholder ring. They are beautiful options, and flatter any finger. Morganite, blue topaz and amethyst are three gems worth considering. A gem that is downright trendy, morganite ranges in color from delicate pastel pink to purplish, yellowish or orangy pink. It is a variety of beryl, a mineral species that includes emerald, aquamarine and beryls in other colors. It ranks 7.5 to 8.0 on the Mohs hardness scale, so it is suitable for normal everyday wear, but it is not as durable as harder gems like diamond, ruby and sapphire. 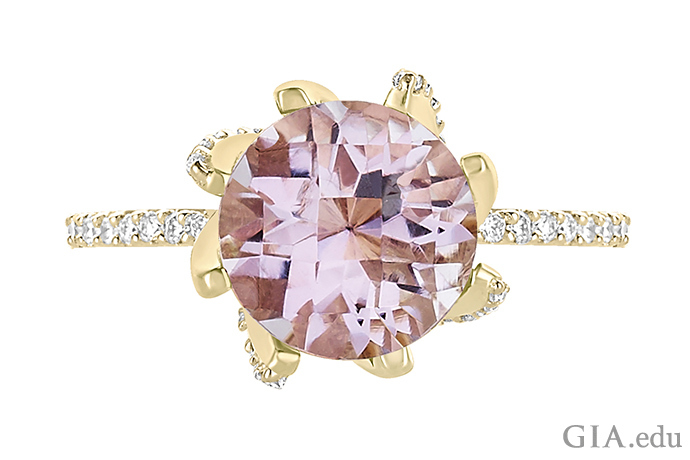 The November birthstone, topaz comes in a rainbow of colors. 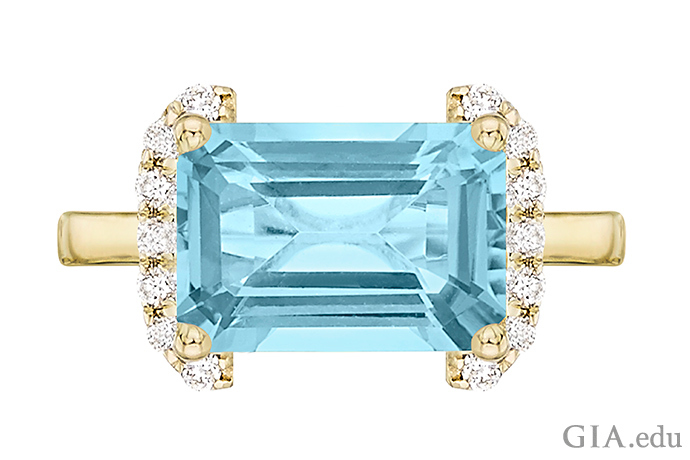 An 8 on the Mohs scale, blue topaz is an affordable alternative. Amethyst, the February birthstone, comes with a royal pedigree: It was a favorite of nobility like Catherine II, Empress of Russia (1729–1796), also known as Catherine the Great, and Wallis Simpson, Duchess of Windsor (1896–1986). Amethyst is 7 on the Mohs scale. Another idea is to include birthstones in a placeholder ring. This might require a little research, as some gemstones, like emerald and opal, are not recommended for everyday wear. You’ll find plenty of placeholder rings with a simulated round brilliant cut diamond (round is the most popular shape for engagement rings). You’ll also see princess cut, pear shape and emerald cut simulated diamonds – along with other shapes and cuts, as well as colored gemstones. Another option is a friendship ring. Fede rings were historically given as engagement rings or tokens of affection. The design features two clasped right hands symbolizing friendship, or the bonds of marriage. 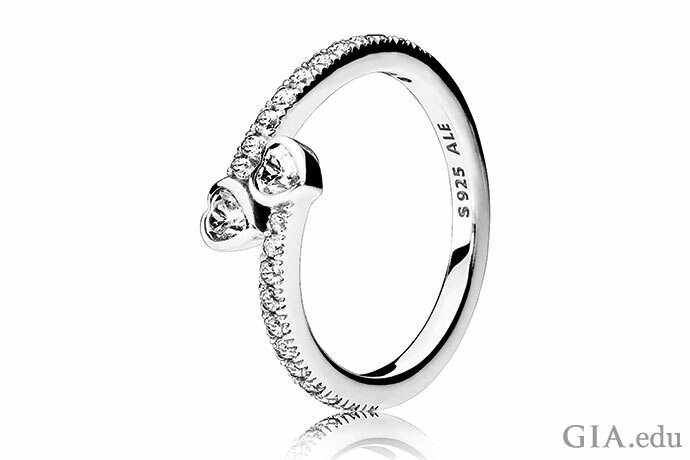 Irish claddagh rings feature two hands holding a heart. Toi et moi rings (“you and me” in French) have two gems, one for each spouse. Explore other types of antique engagement rings to find your own idea for the perfect placeholder ring. How about borrowing a ring from a relative? An engagement ring worn by a family member is a sweet, sentimental way to declare your love. Such a piece of jewelry would be a special placeholder ring. 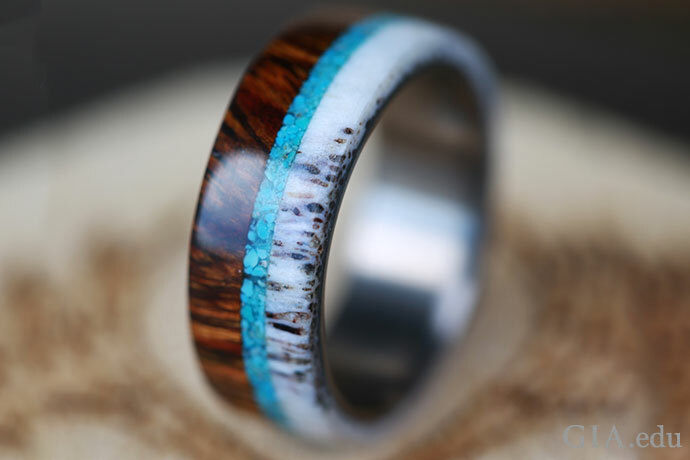 Or consider making your own placeholder ring. Draw on your creativity and ingenuity to fashion something unique and extremely meaningful for you both. For example, you can include in the placeholder ring a memento or material, like strands from a graduation cap tassel or the wire cap from a special bottle of champagne. When you come right down to it, it’s not about the ring – it’s about the proposal. 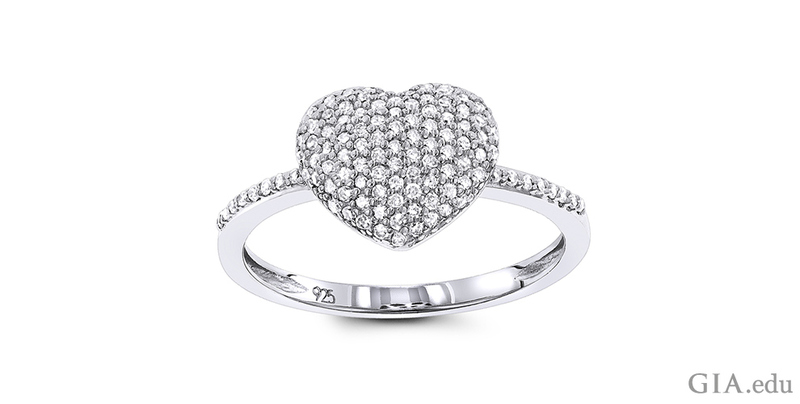 Any ring given with love will forever evoke the memories and emotions of that moment. Ok, you’ve got the ring covered. Here are Five Tips for the Perfect Engagement Proposal.